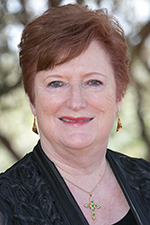 Dr. Eileen Kelly Aranda is the second president of Claremont Lincoln University (CLU). Prior to her presidency, she served as executive vice president for strategy and chief operating officer for the university. Dr. Aranda earned an MBA and a PhD in Business from the University of Washington, specializing in strategic management and organizational development. Her undergraduate degree in anthropology focused on Southeast Asian Studies. She has taught at W.P. Carey School of Business at Arizona State University and The American Graduate School of International Management. She also has management experience in both private and public organizations and for more than three decades she was a management and education consultant domestically and abroad. Dr. Aranda is a sought-after public speaker and executive educator in the areas of critical and creative thinking, multi-cultural negotiations, fostering compassionate leadership, and effective management and organization change at the local, national and international levels. She has co-published several works on leadership and organizational management, including What You Say Does Count: Helpful Verbal Behaviors in Negotiating Commercial Transactions (McGraw Hill); and Teams: Structure, Process, Culture and Politics (Prentice-Hall), which focuses on fostering effective teams taking into account structure, process, culture and politics. Dr. Aranda has been involved with many community activities including, Valley Leadership, Girl Scouts Arizona Cactus-Pine Council, Arizona Venture Team Project, and Sun Lakes Charities. Dr. Aranda was born in Seattle and is married to Luis Aranda who earned his Bachelors of Music and Masters of Education degrees from the University of Arizona. He received his Juris Doctorate from the College of Law at Arizona State University where he has been on the faculty of the W.P. Carey School of Business since 1975 and is now Professor Emeritus.